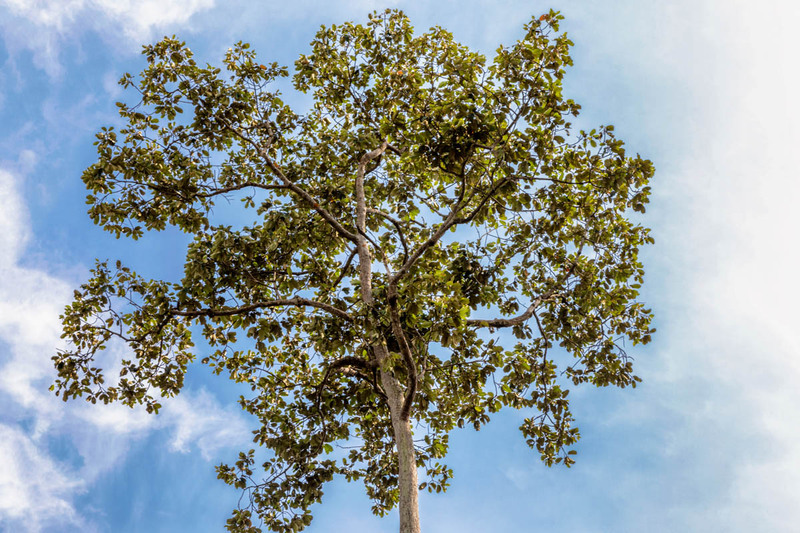 Dipterocarpus is a large genus of tall trees (around 70 species) found across South-East Asia. Locally, they are commonly referred to as ‘Keruing’. 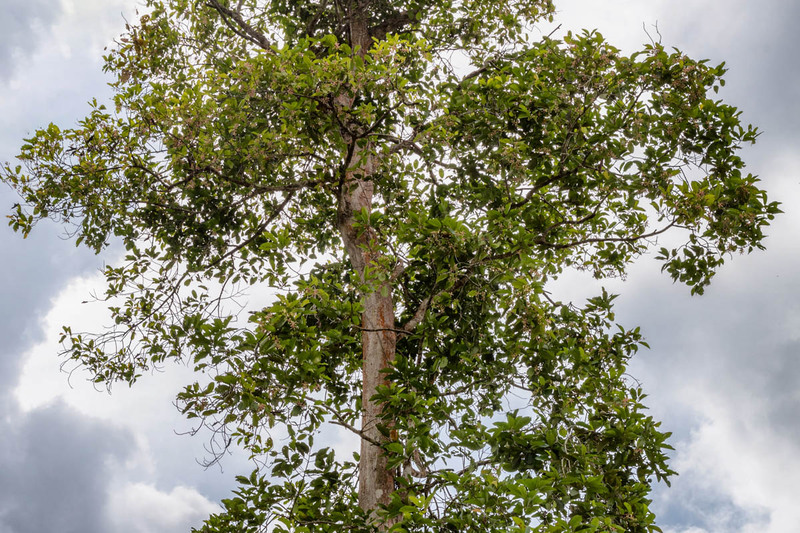 These are big trees, growing to 40 or 50 metres at their full height, and they form a big part of the upper canopy of the forests here, or stick out above the other canopy trees as ‘emergents’. Interestingly, the seeds will only germinate in shade, and for the first several years the young trees don’t tolerate direct sunlight. They thrive on the lowland, yellow leached clay soils that are common across much of Borneo. 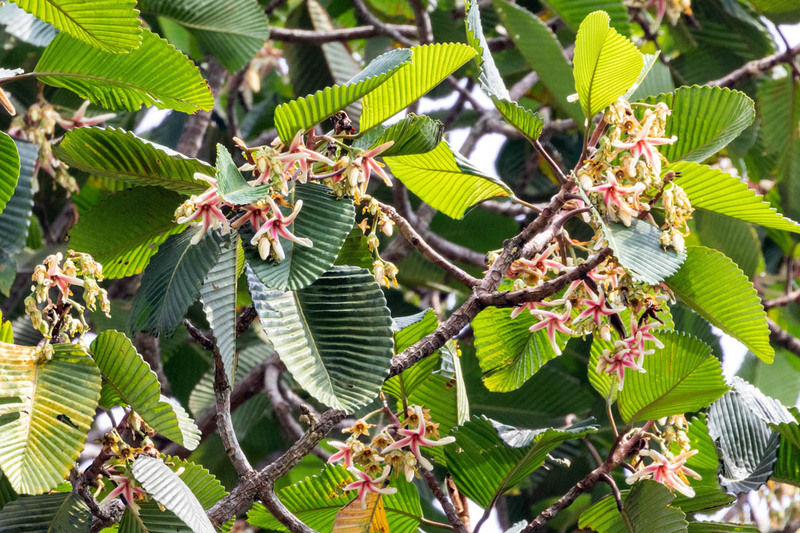 So much so that in fact that the lowland tropical forest is often just called ‘Dipterocarpus forest’, due to the predominance of ‘Keruing’ trees. 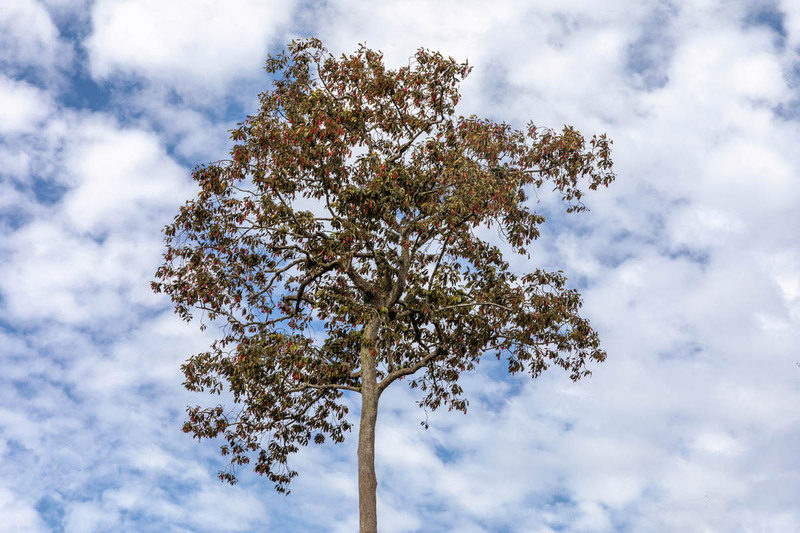 However they always form part of a mixed forest, with other tall trees (meranti, pulai, ulin, bangris etc) also abundant, and which compete for sunlight in the upper canopy. They flower here in October, the mature trees producing masses of large, attractive pink-and white blooms. 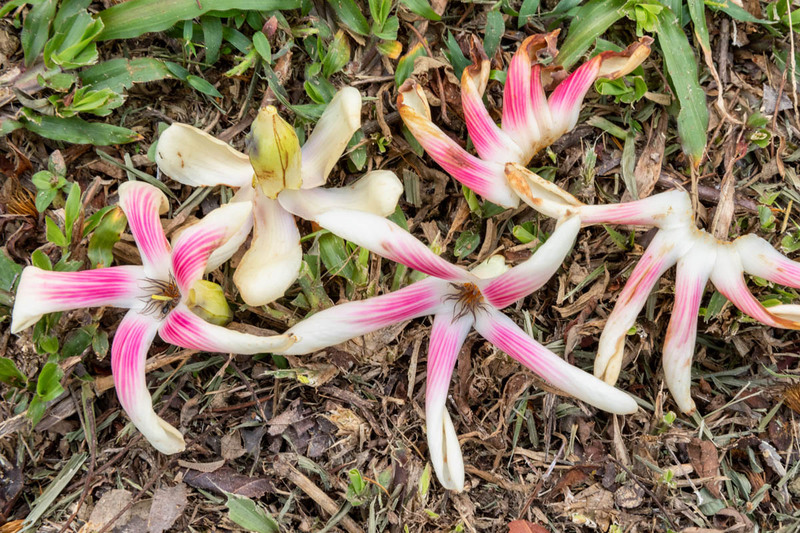 The scientific (Latin) name ‘Dipterocarpus’ means ‘two-winged fruit’. The fruits develop during the early part of the wet season (November – December), with the seeds falling in January. 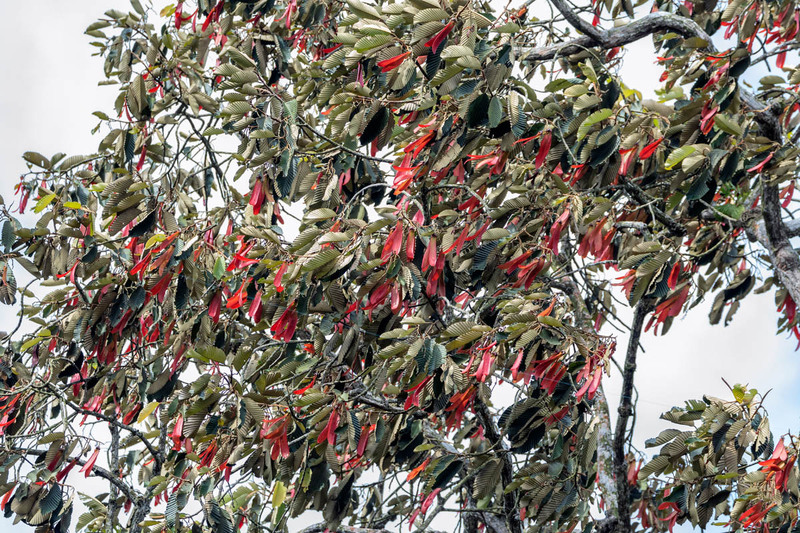 Their ‘wings’ are 20cm or more long, and when the seeds fall from the tree, they can spiral down, helicopter-style, and may be carried by the wind to some distance from the parent tree. They are valuable hardwood timber trees, and the even-grained, somewhat resinous timber has many uses, although it is susceptible to termites. Resin from the live trees was and sometimes still is collected by local people to use for water-proofing and as a source of light. 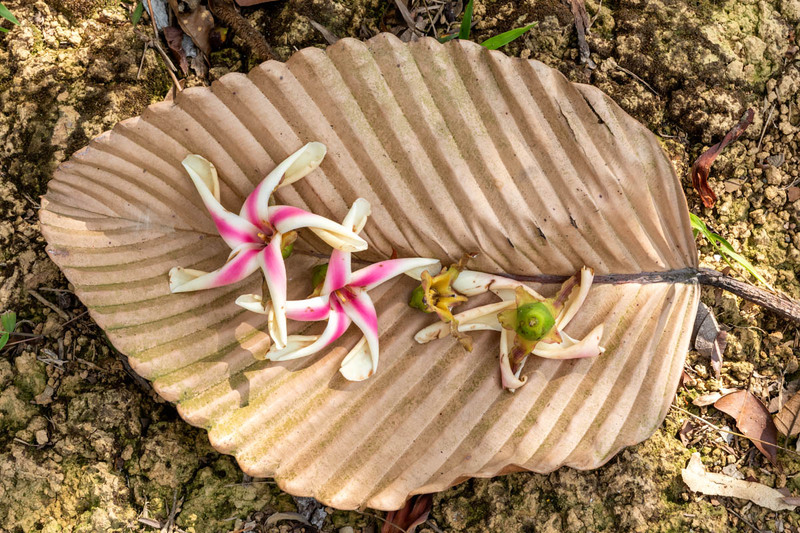 Due to massive loss of habitat (logging, conversion of forest for plantations of oil palms or other timber trees etc), most if not all of the Dipterocarpus species are now classed by the IUCN as being ‘Critically endangered). At the Kebun Raya Balikpapan we have 58 trees from three species in the ‘official’ collection (D. confertus, D. cornutus, and D. tempehes), though three other species (D. elongatus, D. oblongifolius and D. retusus) have also been collected. 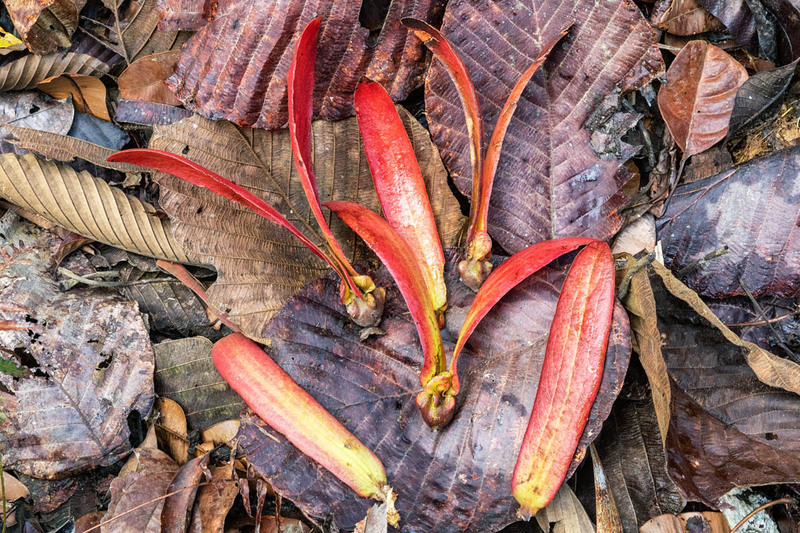 This entry was posted in Indonesia and tagged Borneo, Dipterocarpus confertus, Dipterocarpus cornutus, Dipterocarpus tempehes, Kalimantan, Kebun Raya Balikpapan, Keruing. Bookmark the permalink.